The Akula is a benchmark-sized serious displacement hull. As with most of my hulls, I vary the template, rocker, rail, and hull depth and placement on an individual boardbasis. Lengths run 6’8 to 7’2, thicknesses from 2 3/8 to 3”. 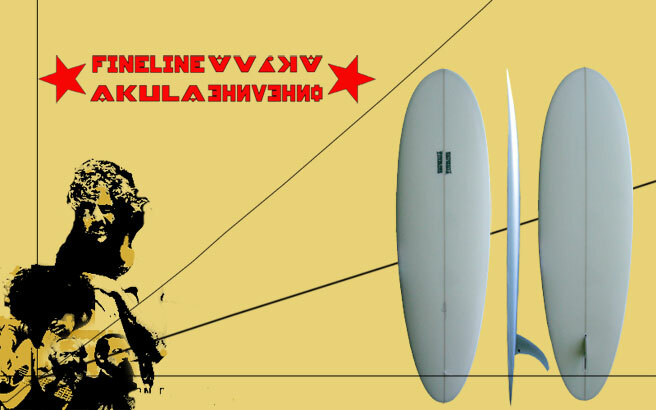 This one is 6’10 18 5/16 X 22 1/4 X 15 X 2 7/8, and a bit more nose rocker; this one accelerates smoothly and quickly, and has good steer off the back foot. Some combos are more demanding than others, but all are glassed with a flex-friendly volan regimen, and come with a flex fin.